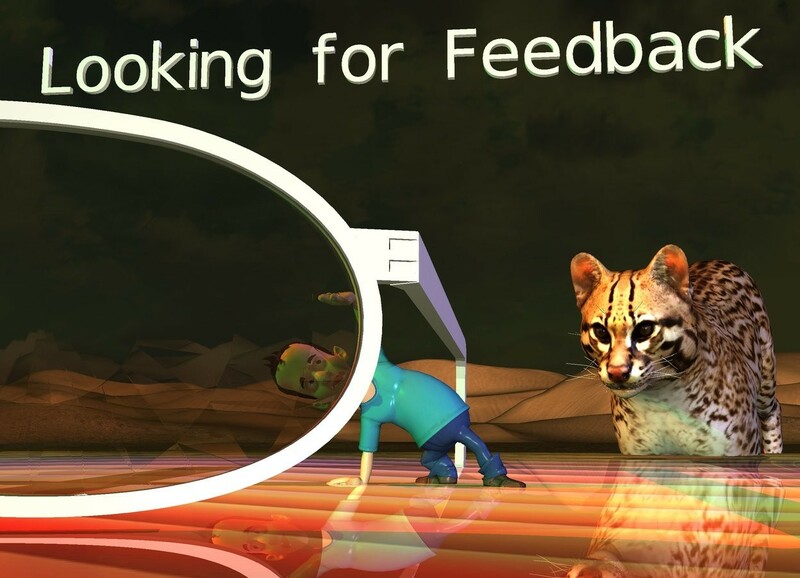 WE"D LOVE TO HEAR ANY THOUGHTS YOU HAVE that will help us grow beyond the very talented users we have to a broader set that includes others who may not have the same penchant for playful experimentation - anything from why they'd use WordsEye to how to best get them up and running. Please feel free to post them here in the comments for discussion or send them to type-a-picture@wordseye.com. Thank you and Happy Holidays! Input text: the white optical device is .3 inch in the shiny [pattern] table. the boy is -2 inches to the right of the optical device. he is 2 inches tall. the very small cat is 5 inches behind and to the right of the boy. it is facing the boy. it is leaning 20 degrees to the front. it is -4 inches above the table. the white "Looking for Feedback" is 2 inches above the boy. it is .7 inches tall. it is evening. the red light is above and 2 inches to the left of the boy. the mauve light is above and 8 inches to the right of the boy. the green light is 5 inches to the left and in front of the boy. I absolutely love WordsEye as it is, but I will ponder this question. . . The reason I joined WordsEye is because I could not draw very well.So i just experiment, although there are still limitations to what I can achieve.Maybe a promotional run in art websites or magazines ! Perhaps adding a way to move the limbs of people, perhaps with verbs. WordsEye is great as it is, but it would be nice to have the people less rigid. An example would be "a person rides a bike," which would cause the person's limbs to change to that of someone riding a bike, with a bike underneath the person. I had a similar thought, that the key is promoting wordseye in the right places to find more people like us who do enjoy playful experimentation. I'm also not very good at drawing, and I do like using words, so this seemed like a good fit for my brain. What I enjoy most about wordseye is the challenge of it and the interactions with other users, especially the visual exchanges with modified scenes. In terms of helping people up that initial learning curve, an interactive tutorial might be a benefit. Give the user a very simple scene, like a cat next to a tree, and have the user generate the words to recreate it. Each new scene could add an element for the user to type in, I guess each preceded by a brief instruction. thanks for the feedback -- keep it coming! a few specific questions: was the template mode (with the example scenes) useful for learning the system, or did you prefer learning by experimenting in a more freeform way? How helpful was the tour/walkthrough? Also, was it easy or hard to learn to move the camera around in 3D space? I agree with much of what has been said thus far. .Personally, I looked at one example, subbed a couple of objects and that was it. I liked the experimental aspects and found it to be the challenge I desired. I was also helped along the way by other users and the WordsEye team as you can attest to. @nheiges idea of an interactive tutorial might be of benefit to users. I was actually thinking something similar though maybe not as functional; that being a side by side window where the user had a create page and a tutorial page together and could build on the create page using info and choices from the tutorial side. Probably a bit more complicated to set up. Another thing I thought of is how WordsEye is almost limited to English speakers. If there were some form a translate program for non English speakers within the system whereby users could select the language they used, it would be more accessible to a larger audience. possibly start with a few base commonly used languages to try it out. As far as the camera movement, because I didn't do much on the practice end of things it took me a bit to figure out the camera (a couple of scenes) but then it seemed pretty straight forward. I would still like to be able to add effects to a scene then return to the create page and add more to the scene without the added effects so that objects and scene elements and effects could be layered (but that is just something I would like to play with). I definitely used the examples in the beginning, but I never watched the tutorial video until just now. It's nicely done, though it would be nice to continue all the way through adding a title, effects, and posting to the gallery. Most of my learning was from other users, seeing things I liked and trying to copy them or asking the occasional question in the chat window. I agree that it would be nice to be able to edit a scene once effects have been added. Learning to move the camera around was intuitive, though frustrating at first when zooming in too close or whatever it is that kicks the view off to the side. I taught adult English as a Second Language for years, and this would have been a great tool for teaching basic syntax, prepositions, and vocabulary. Dear zamchick, the only feedback I can give are my pictures, I love WE, it is awesome. Some "difficulties" are unimportant ... and you also need adventure and experimentation. Thank you KAWE and all! Needless to say we've learned more about what Wordseye can and should be by the works all of you create daily. My initial question is aimed at learning what our most creative, expert users can tell us about expanding our user base to others who might have quicker, more casual interactions with the app. We see people creating art, expressing visual opinions, being funny, and interacting playfully onsite. We want to expand that activity to casual users in a way that works well on both the web and mobile. Coyne's question about using templates eg. building on existing scenes, or improvements to free form use are a couple of ways of focusing on where there are opportunities to explore. So we have a totw each week, what if we had a build a picture whereby WordseEye starts with one object and a subject and each user is allowed to add one thing eg. object, texture, background light feature etc. so that the ultimate goal is to create a collaborative piece at the end of the day? It could be done daily or on weekend only whatever schedule works. This might be one way to involve casual users and get them more interested in the process as well as showing how the different aspects of building a scene work. Perhaps seeing these things as well as getting to know the other users via the building interactions would increase their interest in a more involved use of WordsEye. dear nanook, I think we should not consider technical details of WE (the people there are doing an excellent job). I think we should send out to new users the message, that WE is not an exclusive club in the sense of Groucho Marx: "I refuse to join any club that would have me as a member. "....but encourage new (explorative) users that according to Joseph Beuys "Every human being is an artist"
@nanook, thanks! We've always loved the idea of an exquisite corpse-like activity and something like that (which already happens to some degree in commenting threads) could be fun and engaging. @KAWE, novel ways of reaching out to new users are important too :-) For example, we have seen instances where scenes shared out to Tumblr, FB, and Reddit have brought in a large number of new users. With the new open front page, we think a lot more will ultimately become registered users. 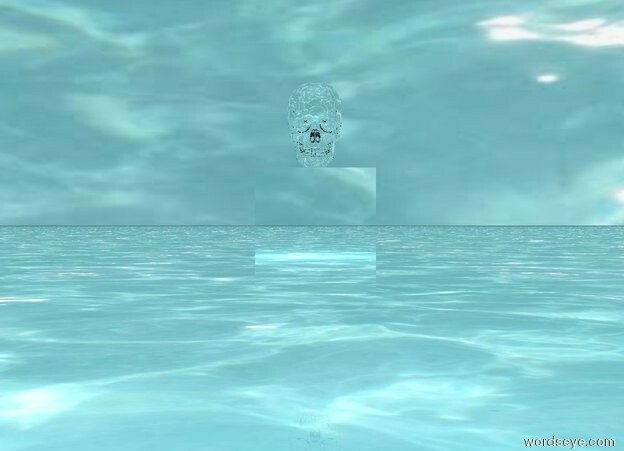 As for me, I love wordseye.... and I agree with all what have been said. The improvements I would desire are all technical: I'd like to have a kind of 'modeler' to create and save own 3d-figures for reuse (for example some kind of grouping-function); I'd like to have the possibility to upload pictures with transparency; I'd like to place images on figures more deliberate; I'd like to have a more deliberate use of textures and a better identification of which texture is used to that object; I'd like to have a way to create more atmosphere; I'd like to have an easier and more deliberate way to to give the objects directions (not only south, west etc. but maybe degrees) and to arrange object to each other; I'd like to make part of objects invisible; I know, all this is pretty technically, but when I made my first wordseye picture I was a bit (just a very little bit) frustrated by those missing possibilities and by the feeling, that most of the pictures have the same look. I never did watch the tutorial. I was looking for scenes I did like and then trying to find out, how they work. So I think the best for learning is not hide the text. And for all newcomers: sometimes a new approach can lead to great results, or at least to a new idea... so we all should work together and help each other (and especially all new user) to feel comfortable, no matter how 'good' (there is a very wide if not endless spectrum of qualities) a picture is. What counts is the idea, first of all. How about a few targeted promotional videos on YouTube, bombarding social media with links to them? E.g. demonstrating how WE can be used by artists/students/teachers to better visualise light & shade effects, reflections/refractions, etc, as a tool to help create their physical works. Maybe directly approach colleges with the idea. Or creative/technical fields like digital games design, as a very quick way to get some virtual world ideas together. As a future enhancement, could allow 3D model import and export for those kinds of users, or an API so programmers could directly hook in. More flexibility with people models would be good too (e.g. wider range, and ability to pose for different actions/activities - something I remember reading about in your white paper). Thanks for all the suggestions/ideas...it's very helpful! Yes, thank you all and to all a happy New Year! Hey. I just started on the site and have a couple things to say. I signed up for the beta and was given the opportunity to create a piece many months ago. The retro-futurism of it was the biggest pull for me. I made my first frustrating render and then left it half-baked cursing the site's "words to images" declaration as too good to be true. But many months later curiosity has brought me back and I have since been able to check out the gallery and see many things that give me that "Eureka" moment. For instance the silver cave and head image, for me, redefined the parameters of how the art on this site could be created. I think it would be awesome to see those sort of parameter redefining moments and pieces acknowledged with some distinction :). Anyway thanks to the creators for this unique artistic medium! Thanks for the feedback @pepe! Good to know what got you over the hump.